Phnom Penh (FN), Jan. 25 – The Ministry of Information issued a letter to explain the procedures to re-launch the offices of Voice of America and Radio Free Asia in Cambodia to the Ministry of Foreign Affairs and International Cooperation. “As required by General Department of Taxation, VOA and RFA shall fulfil the tax obligation first before they could be legally registered to the Ministry of Information,” according to the Information Ministry’s letter dated Friday, addressed to Foreign Affairs Ministry. "The Royal Government always cherishes promotion of freedom of press and expression in accordance with the Constitution and laws in force. Previously, there were complaints that freedom of press has been restricted, particularly regarding The Cambodia Daily, RFA, and VOA. For these cases, here are the facts: The Cambodia Daily shut down its publication on its own due to its failure to fulfill tax obligations in accordance with the Law on Taxation. In the event that such liabilities are legally met, the newspaper can resume its operation. The closure of Radio Free Asia' and Voice of America' representative offices was self-initiated. 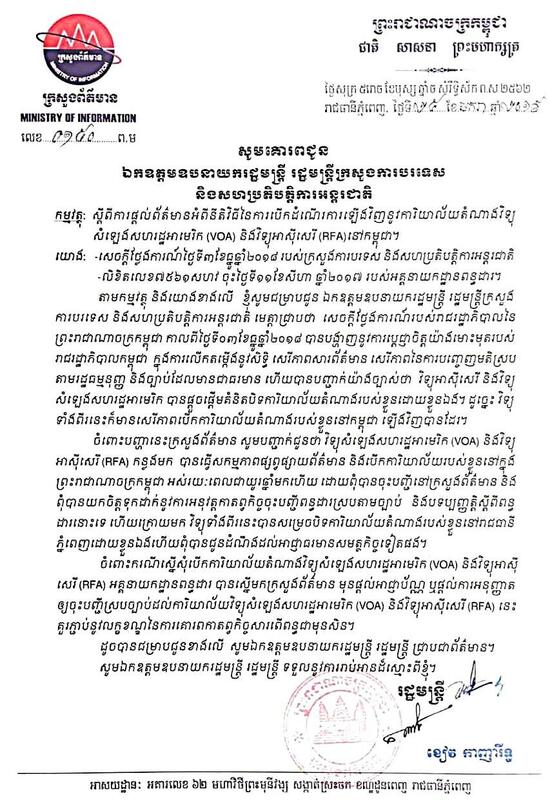 The two radio stations are free to reopen their offices in Cambodia,” according to the statement. Cambodia has never banned Voice of America (VOA) and Radio Free Asia (RFA)’s broadcasts, and that Cambodian people are still able to listen to these two radio broadcasts as usual, Minister of Information Khieu Kanharith told outgoing U.S Ambassador to Cambodia William A. Heidt in a farewell meeting in late November. The minister added that Cambodia wanted VOA and RFA to setup their offices in Cambodia for effective communications and to promote freedom of press in Cambodia.